For, the riches of the good are utilised for the welfare of others. Sriram V, the author of this book* on Sundaram Finance Limited (SFL), brought out on the occasion of the Diamond Jubilee of the Company, quotes the above translation of a Sanskrit verse to describe the manner in which T.S. Santhanam led his life and steered Sundaram Finance Ltd. of the TVS Group. The book is in many ways the history of growth and development of the road transport industry in India and the efforts of T.S. Santhanam and SFL to make affordable finance available to a vital but vulnerable section of a newly independent nation. It is also a story of entrepreneurship, innovation and pioneering spirit, says T.T. Srinivasaraghavan, the present MD of SFL in his Foreword. The story begins with several businesses being carried forward in the name of T.V.Sundaram Iyengar, the founder of the Group. These were related to auto component manufacture and the retailing of automobiles and spares. Venturing into the area of automobile finance was left to his fourth son, T S Santhanam. 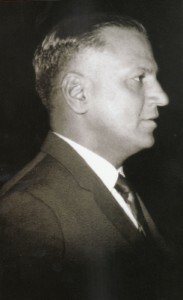 As early as 1948 Madras Motor Insurance Company (MMI) came into existence with Santhanam as its MD. The Company branched into other areas of general insurance, fire and marine in 1960, when it changed its name to Madras Motor and General Insurance Company (MMGI). While this business was doing well, Santhanam was already looking at growing his pet project, Sundaram Finance. Thanks to his involvement with the Motor Vehicle & Allied Industries Association, he was aware of the non-availability of easy finance for operators and fleet owners. While banks dealt only with large commercial establishments, the small fleet owners were left high and dry. According to Santhanam, it was these transporters who persuaded him to get into the finance business. Till the end of his life he would always maintain that Sundaram Finance was established for the welfare of truck and bus operators. Sundaram Finance came into existence on August 11, 1954 as a subsidiary of MMGI. Among the first loans from the company was one to a VIP customer, M. G. Ramachandran, who received a loan of Rs. 66,000 at 7.5 per cent interest for the purchase of a new Fiat car. 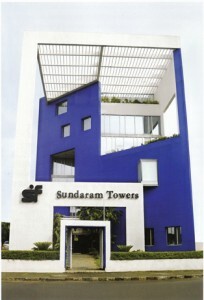 Sundaram Towers, designed by Charles Correa. The South India Hire Purchase Association (SIHPA) came into existence in 1967, with the Sundaram Finance office as its registered address. It was an organisation that was very close to Santhanam’s heart. In 1975, with the country having over a dozen regional hire purchase associations, there was born the Federation of Indian Hire Purchase Associations (FIHPA) with its headquarters in Delhi. This was also the time when the TVS Group entered the manufacturing field, with SFL, in particular, providing financial support during the setting up of the various companies. In order to run the business on professional lines, right from the beginning Santhanam focussed on systems. To cut down on delays occurring from unnecessary paper work, SFL was computerised way back in 1968. According to an IIMB case study done at the time, the backbone of SFL was its personalised intelligence network. It was in the 1980s that SFL began venturing north of the Vindhyas for the first time. As SFL spread its network in the North, its business methods were to give rise to slogans like Sundaram ka paisa Balaji ka paisa (meaning money loaned by SFL was God’s money). The other popular expression was Sundaram ka paisa phulta hai – borrowing money from SFL brought prosperity. By early 2000 SFL had spread across the length and breadth of the country. SFL, today, has over 500 branches and 2 lakh depositors and borrowers. Apart from vehicle finance, the Company now offers loans through its subsidiaries to finance homes, tractors, etc. A Sunday concert at Nageswara Rao Park, courtesy Sundaram Finance. While SFL has been known since its inception for the best practices it follows like knowing the customer, not compromising on principles, remaining close to core strength, another constant is one of support to organisations connected with art and culture, healthcare and heritage. Apart from major institutions, SFL encourages children’s participation in art and craft, music and personality development, through year-round programmes. 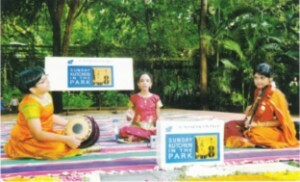 Chief of these is the ‘Concert at the Park‘ series wherein young children who are proficient in Carnatic music are encouraged to perform at the Nageswara Rao Pantulu Park in Mylapore on Sunday mornings. Perhaps a more visible sign of the Company’s involvement with culture and local traditions is the Sundaram Finance Mylapore Festival, started by the weekly tabloid, Mylapore Times. Celebrated every January, it is a people’s festival that is marked by the enthusiastic participation of the community. SFL began its journey chiefly as Santhanam’s dream. The naysayers were plenty, but he alone saw what others did not – that there existed a space for a company that would handle vehicle finance on professional and ethical terms. He also envisioned it as a safe investment opportunity for countless people of India who brought all their little to him and his company. He considered himself answerable to each of them and it was this trust and goodwill that enabled the Company to grow. That the banks and financial institutions came forward to fund the growth of SFL is really an outcome of the way SFL stood by its depositors and customers. It was the value system of the Company that enabled its growth and which has remained constant over time. Today, Viji Santhanam, the youngest son of Santhanam, heads the Company.